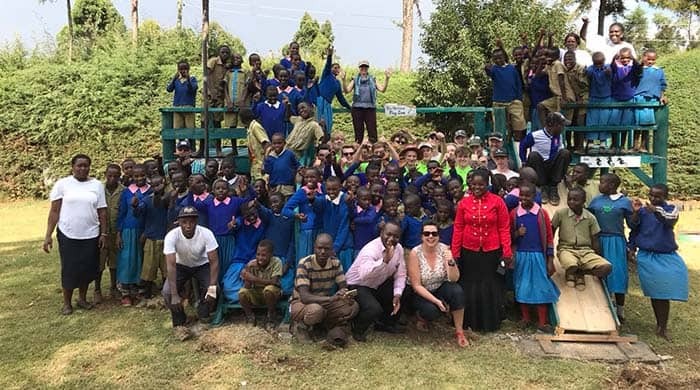 Other humbling experiences during the Kenya Trip included the feeding scheme which entailed small groups of Elizabeth College boys serving cups of local porridge to over 1100 school children at Sulgwita Primary School and teaching lessons. Maths, Music and P.E. were popular amongst the children, it’s fair to say that the kids attitudes to learning put the majority of us to shame, evoking some guilt amongst the campers who had disrupted lessons in the past. With the climbing frame all but complete on Sunday, we were afforded a pleasant luxury. A trip to Lake Nakuru National Park, featuring guest appearances from Lions, Zebras and Hippos, went down a treat. This included a visit to the Lake Nakuru Lodge and we all welcomed opportunity for a refreshing cold swim and drink. A return to work on Monday meant installing the final elements of the climbing frame, whilst Tuesday brought the joy of Creosote. With ‘Mrs Norman’s Playzone’ finally complete the local children treated us to a display of local songs and dances encouraging some of us to join in, most notably Louis Tostevin’s funky jive which will stay with the local children for quite some time! The final challenge was to be a football match against the school’s work force team. The match had been highly anticipated, which much discussion over tactics and personnel. The mood shifted significantly when the opponents arrived in full kit, including shinpads and studded boots. Indeed, due to a mixture of poor fitness at altitude and technical ineptitude, we found ourselves on the receiving end of a 4-0 drubbing, at least, this year, no one needed a trip to Nakuru Hospital. Despite the loss it was an enjoyable game and a great way to end our stay at St Andrew’s and TCP.